It has been a while since I have been asked to review a product on my blog but if someone wants to send me something shiny then I am more than happy to do so. In this case I have been asked to review any laptop case from GearZap. As someone who attends a lot of tech events I needed something that was going to protect the laptop form the usual knocks and bumps on the train, have handles to carry it with other bags in the same hand, and not look overly shabby. 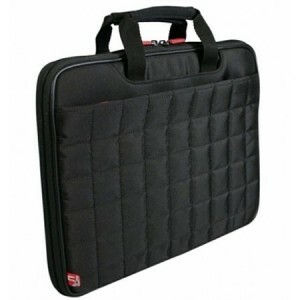 I could chose any of these 15″ laptop cases but with some advice I selected the Port Designs Berlin Laptop Bag 15/16″ Sleeve. It met the requirements and looked smart enough to for most occasions without feeling odd at social occasions. When unwrapping the bag I was quite pleased with with the look and feel as it came across as not overly cheap, but on overly posh. A middle ground I am most comfortable in. The case is designed to so you can open it up and the computer and function without it being removed. Annoyingly it appears that unless your laptop is the exact size required it will just pop out of the holders. Initially this was disappointing but I find myself slipping the laptop in and out with ease so much it is a feature I am probably best without. My first outing with the bag was to a hack day where I already had another bag with the usual hack day bits and bobs in (mouse, power strip, external HDD, sleeping bag, etc) so the bag was just being used for the laptop and the power supply. The bag has a large zip pocket that holds my small power supply and UK power lead without loosing it’s shape, but squeeze in any more and it looks like it has been eating pies and not exercising. If you carry lots of junk with your laptop then this bag is probably not for you, but if you just need a small PSU like me then it is ideal. There are also two open-topped pockets with Velcro under the handles. The handles fold neatly in to these pockets but I have not yet had cause to do this. They are convenient for pens, business cards, flash drives and other small items. The handles are also well padded so are not constantly digging in to your fingers like many bags I have had in the past. There is no shoulder strap as it is just not that kind of bag. So in summery it is a good smart looking bag if you travel light and well worth the £30. If you need to carry more or need both hands then you are probably better of looking for something bigger. For me it is spot on and I will definitely continue to use it. Next Entry: Broadband and line rental for £8.56 a month! Next Entry Broadband and line rental for £8.56 a month!